Mom's Gone Bronson! : POSSIBLE FREE Quarter Pounder! Go Go Go! GO GO GO! 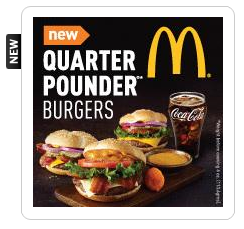 Some accounts over at www.mycokerewards.com/ are getting a FREE QUARTER POUNDER! Just head on over there and add the code: IMOUTTAHERE for your FREE reward with ZERO points needed! I got one! Did you?!! Note: Not all accounts are getting one, but fingers crossed that you're lucky enough to score one! YAY! Disclaimer: Mom's Gone Bronson has not been compensated for this post, nor can they guarantee your chances of receiving the free reward, which lies solely with mycokerewards. Thank you! Yum! My husband loves McD's Quarter Pounders! Thank you for sharing.